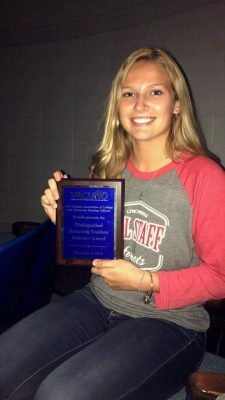 Gabby Jones ’19, a University of Lynchburg resident assistant, recently was honored statewide for her work to build a fun community for students on campus. She won the Distinguished Returning RA Award from the Virginia Association of College and Housing Officers at a conference November 2-3. The award recognizes her standout performance as an RA who has served campus houses as well as a first-year residence hall. Jones, an interdisciplinary studies major with an emphasis in elementary education, said she became an RA during her sophomore year because she wanted to connect with the rest of campus more. “I was looking for something that would help me build confidence, leadership skills, conflict resolution skills, and become a part of the family on campus,” she said. That year, she served the Southside community, where many juniors and seniors live in campus houses and townhomes. Director of Residence Life Kristen Cooper could tell Jones was up for the challenge. “Gabby provided a great deal of opportunities for those upper-class students to grow and develop within their community,” Cooper said. After completing an internship at Walt Disney World in the first semester of her junior year, Jones took an opening as an RA in Tate Hall, one of the first-year residence halls. “Gabby worked hard to develop a close-knit community,” Cooper said, citing her skills for helping roommates work out differences and creating programs that were both educational and fun. Jones is a role model RA, she said. “She is eager and willing to step in and help and is constantly looking for more opportunities to grow and develop in her role as a leader on campus,” Cooper said. Jones said she tries to make the residence halls a great place to live by creating an atmosphere she describes as “welcoming, homey, fun, and inviting.” She involves her residents in selecting decor, including colorful shower curtains, so the halls feel more like home. She plans to take her residents to the University’s Claytor Nature Center for a weekend outing soon. She was surprised when she was nominated because to her, she’s just doing her job. “I put a lot of effort into my position but I have never asked for anything in return and wouldn’t have it any other way,” Jones said.